Midi skirts are that never fading piece that will always have a special place in women’s wardrobe. It is suitable for many occasions. Business ladies absolutely love it. And midi skirts can be worn in so many different combinations. It is up to you and your creativity to find out which one will suit you best. And today I have some midi skirt outfits ideas that will inspire you. If you don’t already own a midi skirt, go and grab your perfect one! A black midi skirt can go with just anything! Pleated shirt is good choice for making simple black skirts stand out. It is a great casual combination, that features street style with a stylish note. If you are brave enough, try mixing different patterns together to get the effect! 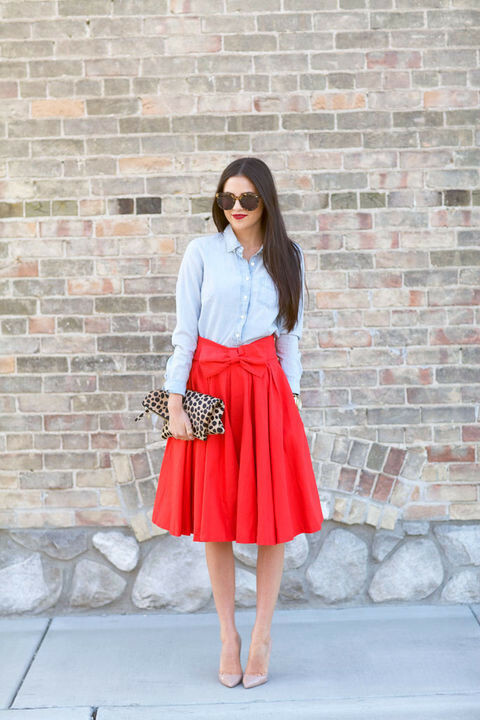 Midi skirts will be a great pair with crop tops. Try this one, as it is so trendy. Bright colored skirts are a must for spring. Light peach color is something that looks gorgeous and is easy to pair with. A big and rich with texture necklace will fit perfectly in an outfit like this one. Having some trouble deciding which type of shoes should you wear with midi skirts? Stilettos will always work. Also, some trendy sandals can be worn too. Even small heels can add a whole different look to the outfit. Also, they are suitable for this season. Take a look at this amazing outfit. It perfect for the evening. A midi skirt with tulle details is an elegant piece by itself. Pair it with some simple sandals and a crop top. Simple one, but looks gorgeous!